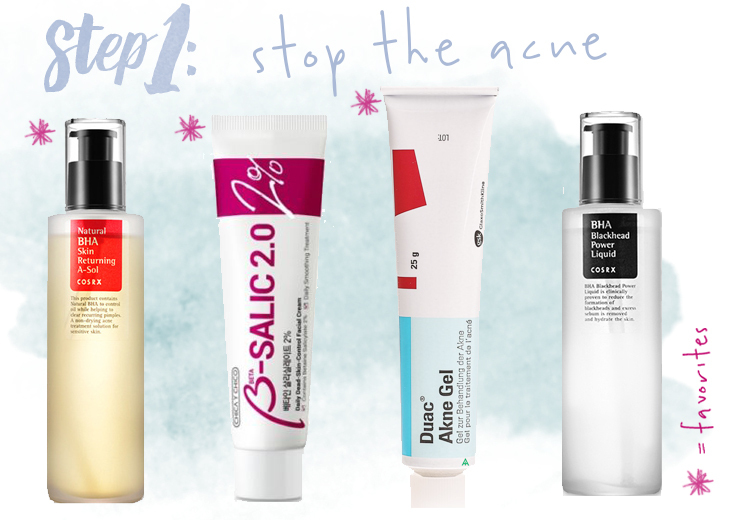 Which brings me to my first and most important point: Stopping the acne. 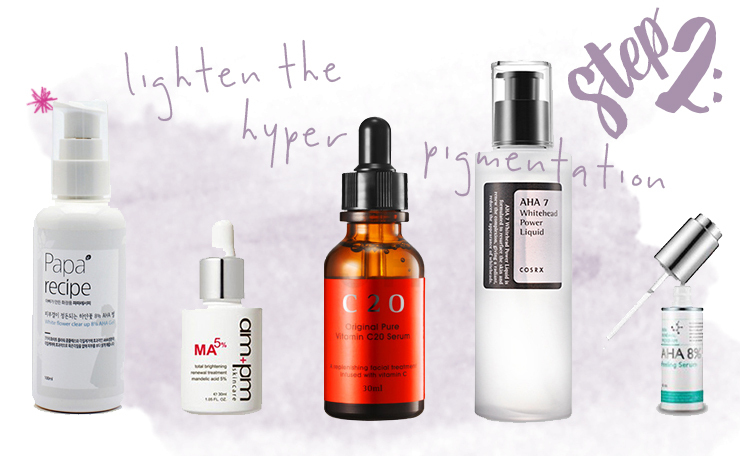 Obviously, it's quite impossible to combat hyperigmentation when your skin regularly throws a rage party on your face without thinking of cleaning up after itself. Unfortunately, as manifold as the reasons for acne are, as various are the possible solutions for calming your skin. While the root of my problem was mainly psychological, I was also quite oblivious at that time when it came to skincare and just slathered on my face whatever I considered fancy without really thinking about what it did to my skin. Getting in place a well thought-out routine has not only helped me to calm down my acne tremendously, but to also keep it that way without the use of harsh chemicals or even antibiotics (which didn't help me anyways..). I got ahead of myself and tried various AHAs that only made my face itchy and didn't help at all with the acne. It's definitely a lot of trial and error necessary, but products with good old BHA (beta hydroxy acid or salicyclic acid) did a good job at keeping the more deep and painful pimples at bay. Also, when my skin looked still like this the only thing that helped me is the Duac acne gel that I got as a prescription from my derm. Honestly, my skin was in such a bad shape that it was never healing - whenever a pimple would go away the next would just pop up and I was constantly stressed and in pain. 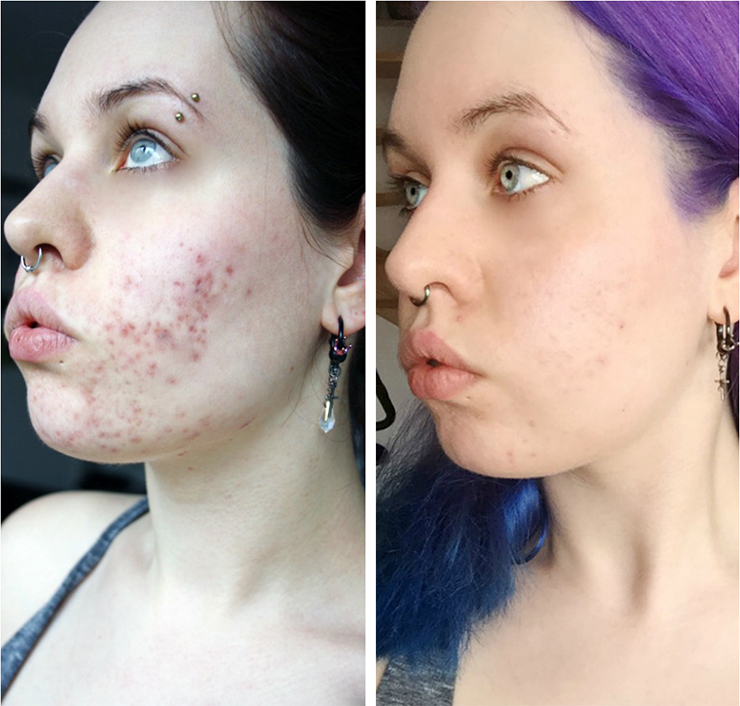 My derm wanted to put me on Accutane as other meds have proven to be ineffective (I tried Doxycycline and had devastating cramps for three months with little to no improvement in my skin) but I declined as I was quite terrified due to all the horror stories I read online. I didn't like the fact that it basically alters your DNA (yeah.....it does that) and tried every other possibility. The duac acne gel was a HUGE savior for me as it was the only thing that really helped keeping my acne at bay. It dried my skin out like crazy, but it was worth it. After about a month, I hardly had any painful cysts anymore and I used it less regularly (switched from nightly to every second or third night). Another thing that really helped me (and I know not many are a fan of) are regular extractions from my dermatologist/aesthetician. Aesthethicians have quite a bad reputation but I was very lucky to find one who has an actual medical background and knows how the skin works (yes, this should be mandatory but sadly it isn't from the stories I've heard.) I noticed that no matter how many acids I threw at my face, my skin seems to be bad at cleansing itself and is very prone to clogging. I got every 4-6 weeks to the derm now and around the 5th week mark, I can feel my skin clogging up. If I don't go and get the extractions (which stupidly I didn't for 2+months because I was busy working 50hrs+/week) my skin falls back into bad habits and develops cystic painful acne. So no, my acne is not completely cured but I found a way to effectively keep it in as good a shape as possible. Also, I switched to a mostly vegetarian/vegan diet (due to my significant other being a lactose intolerant vegetarian who would murder for cheese - I never cared much for meat so I mostly just adapted even when I'm by myself) and that certainly might have had an impact. 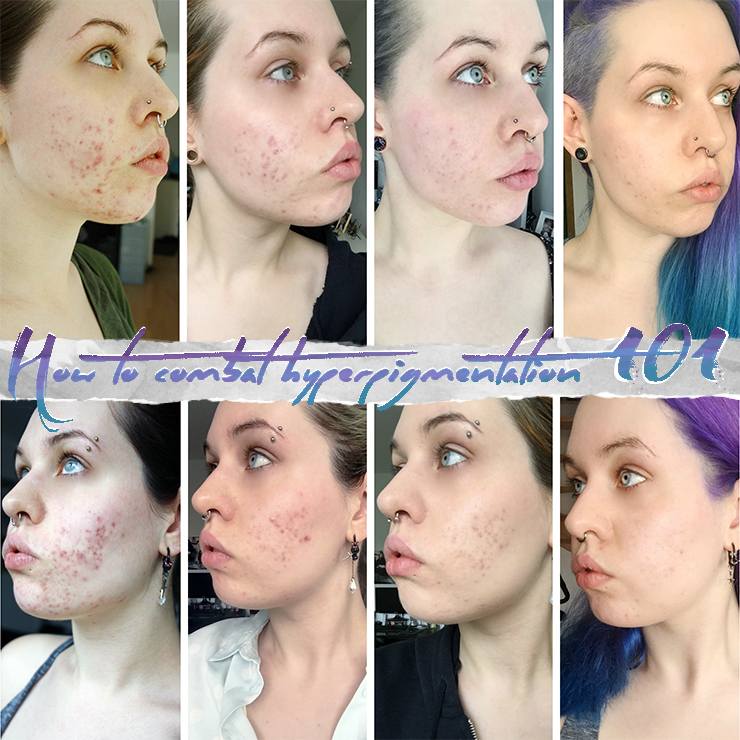 However, dietary changes, drinking lots/little water and/or no make-up seem to have only very minor impact on my acne as I've tried it all separately. Let me tell you something: Fading pigmentation needs PATIENCE. And I mean, real patience. Those pictures in the beginning of this post are all MONTHS apart. The first and last pictures are more than one year apart. I am not trying to put you down but please don't put any unrealistic expectations on your skincare as it can only do so much and will only drag you down if your expectations are too high- I promise you, it will get better. But it will take time. Also, whenever I stress about how "bad" my skin looks, it just gets continually worse as the psychological impact can be quite strong. I accepted the fact that I have good skin weeks and worse ones but that's totally okay because I have a routine that I can adjust accordingly. If you've read my blog for a while now, you will know that I had a horrible time with AHAs. All the ones I tried have either broken me out terribly or left my skin quite raw, itchy and just not comfortable. A mistake of mine was that I wanted too much at once in the beginning - I was still trying to get my acne under control and tried to attack it with BHA and AHA while figuring out a skincare routine that would help my skin heal without overwhelming it. Needless to say, it was way too much. So I didn't use AHAs until I had a solid routine that I knew worked and also knew that my skin was already accustomed to BHAs as I've been using them for a few months. Also, I used to use vitamin C very religiously every night until....I didn't anymore. I just never ordered a new one when I ran out and I don't have that much time most mornigs/evenings so I kinda stopped. I did use it for a long time though and even though the results were not as good as the ones I got from religious use of AHAs and sunscreen, I really liked to use it and will likely order a new one in the future. I have to admit though: Even though it did not do any big lightening wonders for my skin it did give me a certain glow that I am missing now. If I had to chose though or if you want to spend money on just one item, I would vote in strong favor of any AHA over vitamin C for my personal experience. If you have the money though, it's a nice little extra kick for your skin to be the best it can. Anyways! 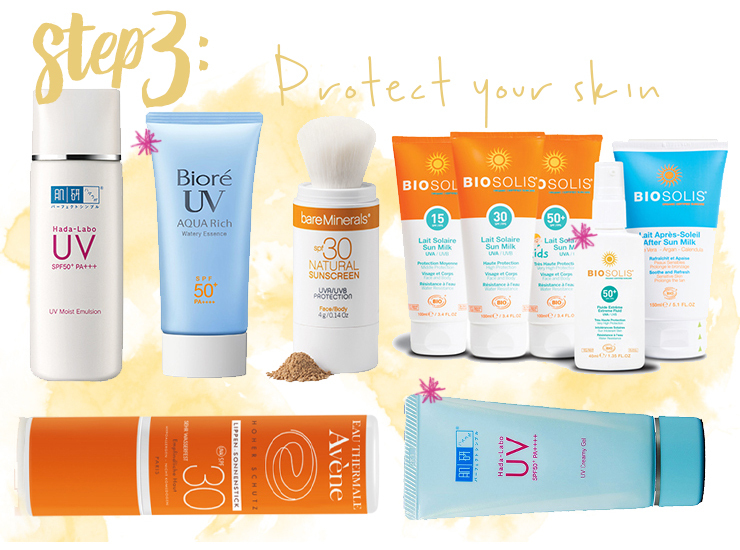 In order to protect all the hard work you put into your skincare, establishing a good suncare regimen is essenital to fading hyperpigmentation and preventing the building of new one. After much trial and error for around 1 1/2 years I found that chemical sunscreens alone don't help me much when it comes to fading acne marks. I've been using the Biosolis Extreme Fluid SPF50+ for around a year now on and off - it's a pure (Western) physical sunscreen and while it's not as cosmetically elegant as (Asian) chemical sunscreens, it did a way better job at helping those nasties fade. Unfortunately, nothing is perfect: I use the Biosolis physical sunscreen in order to protect my skin and it does an impeccable job, however, it is a lot more thick than my beloved Asian sunscreens, leaves quite a white cast (not that that would be a problem for little white ghost me but I would really not advise it for anyone darker than NC20-25 :/ ) and feels more greasy. It is manageable under make-up if you wait long enough for it to sink in but let's be honest - who has that much time? What I usually do is use my favorite Asian sunscreens from either Biore or Hada Labo (see picture above) daily, let that absorb while I make coffee and then put the physical sunscreen on top only where my hyperpigmentation is the worst (my cheeks). This way I get the protection where it's most important without sacrifying too much time most mornings. Please note that mixing sunscreens on top of each other can be problematic depending on the ingredients, but the combination with Hada Labo and Biosolis has worked well for me but I try to wait as long as possible between the application. Also see here and here for a bigger resolution of in-between steps. I am definitely happy that I took all those painful to look at pictures because it is so much more easy to track my own progress and to figure out what works for me. If you're unsure if you're making progress, take pictures and compare them! Don't do it too often though as it can be very discouraging - I took pictures only once a month and tried to be consistent with the light source as it can make your skin look vastly different/worse than it really is. Also, don't be too discouraged if you don't see any progress sometimes. It happens. Also, if anyone is still reading (is there..?) a very concise update about why I haven't been blogging for the longest time: Broke up with my long term boyfriend, had to move in with my cousin for a while, started my first real adult job while working 50+ hours, moved into my first own apartment but didn't have internet for the longest time - have my own 2-room apartment since July and a really cute girlfriend, so all is well now. Thank you everyone who emailed me about being okay I REALLY appreciated it. 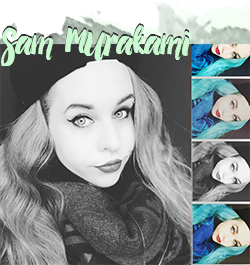 It was just a really crazy time for me and I'm doing better now and look forward to blog more regularly like I used to, I missed it a lot!